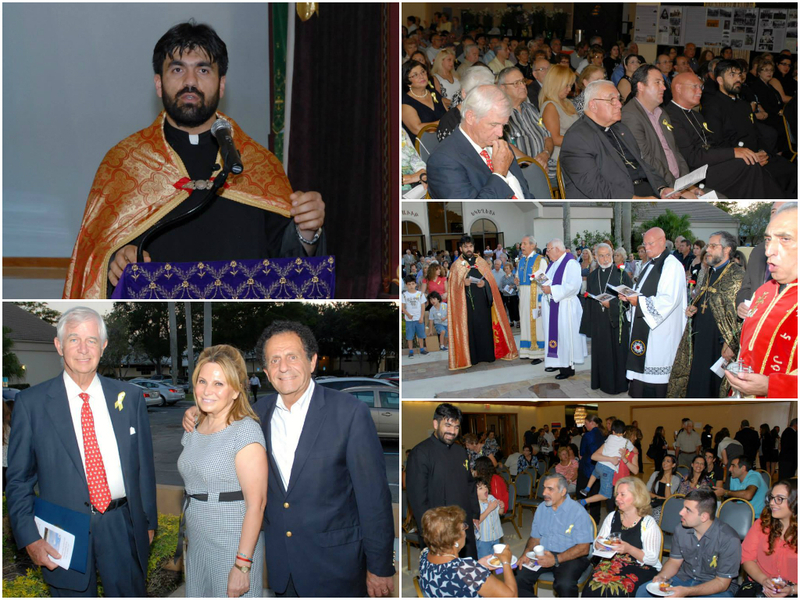 BOCA RATON, FL – On Thursday, April 24, hundreds of members, friends, academics, clergy and human rights activists from the South Florida Armenian American community gathered at St. David Armenian Church to commemorate the 99th anniversary of the Armenian Genocide. Armenians around the world commemorate the genocide on April 24, when in 1915 Turkish authorities arrested some 250 Armenian intellectuals and community leaders in Constantinople. Thereafter, Armenians were uprooted from their homes and forced to march for hundreds of miles, depriving them of food and water, to the desert of what is now Syria. Over 1.5 million Armenian men, women and children perished in 1915-1923 in what historians recognize as the Armenian Genocide. While 23 countries have officially recognized the events of the period as genocide, Turkey denies the word genocide as an accurate description of the events. In recent years, it has faced repeated calls to accept the events as genocide, but has refused to do so. As the Armenian community commemorated 99 years of a genocide unrecognized by its perpetrators, the focus of the program echoed a growing shift. Instead of looking to the past, the evening highlighted the survival of the Armenian people and looked to the future, through artistic expression. Mr. Taniel Koushakjian, Communications Director of the Armenian Assembly of America, served as master of ceremonies and took the crowd through the evening’s events. 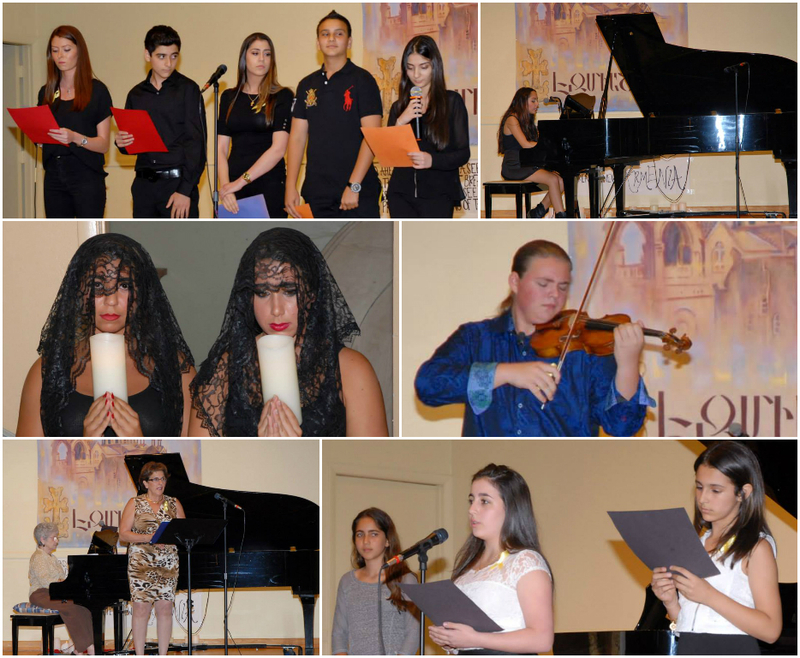 The program included several artistic performances by local Armenians. Some read poetry, others played the piano or violin, while still others danced or performed vocally. Fr. Galstyan of St. David Armenian Church and Fr. Joulfayan of St. Mary Armenian Church offered the memorial service for the victims of the Armenian Genocide. Fr. Saba of Saint George Cathedral, Rabbi Rosenkranz of Congregation B’nai Israel, Rev. Endruschat of Good Shepherd Lutheran Church, Fr. Leondis and Fr. Klund of St. Mark Greek Orthodox Church, Archpriest Gvosdev of St. Nicholas Orthodox Church, Fr. Marashlian and Fr. Jebejian were also in attendance. 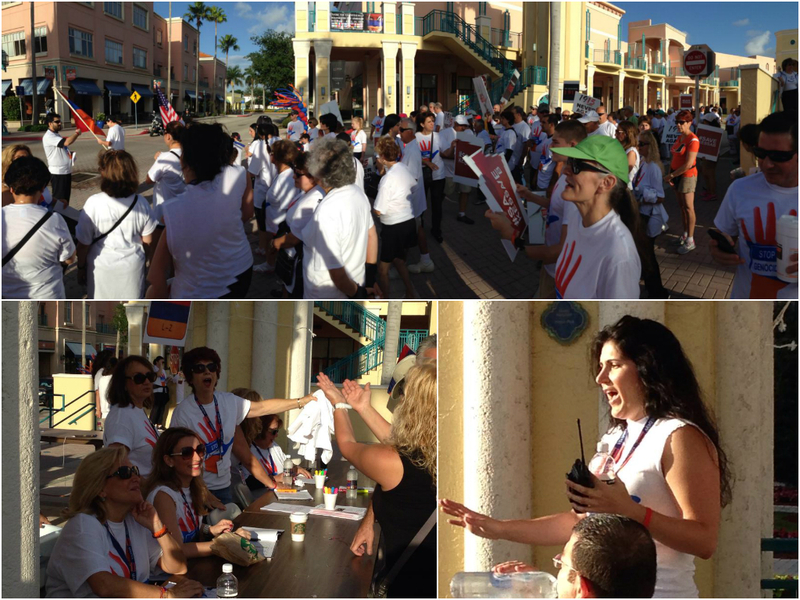 This year’s commemoration followed on the heels of the April 12th Walk Against Genocide in Mizner Park, a walkathon organized to raise funds for genocide awareness, community outreach and advocacy for more comprehensive genocide education in Florida public schools. Both the April 12th Walk Against Genocide and April 24th commemorative service at St. David Armenian Church were organized by the Armenian Genocide Commemoration (AGC) Inc., a nonprofit organization comprised of representatives from various Armenian American organizations and churches in South Florida. AGC Inc is dedicated to observing the Armenian Genocide, as well as bringing awareness to the public on all genocides. 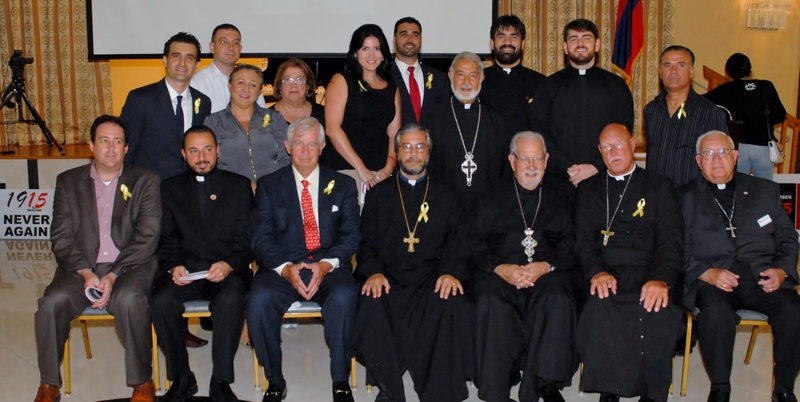 The committee was incorporated in February 2014 and is comprised of representatives from the following South Florida organizations: St. David Armenian Church, St. Mary Armenian Church, Armenian Assembly of America, Armenian National Committee of America, Armenian Relief Society, Florida Armenians, Homenetmen, Armenian Revolutionary Federation, and Knights of Vartan. BOCA RATON, FL – An upcoming walkathon in Boca Raton will mark the 99th commemoration of the Armenian Genocide of 1915, whereby 1.5 million Armenians were systematically exterminated by the Ottoman Turkish Empire during World War I. Event proceeds will go towards genocide awareness, community outreach and advocacy for more comprehensive genocide education in Florida public schools. The Walk Against Genocide, a two-mile walk which will take place Saturday, April 12 at Mizner Park, is organized by the Armenian Genocide Commemoration (AGC) Inc., a nonprofit organization comprised of representatives from various Armenian American organizations and churches in South Florida. The mission of the AGC is to educate the public about the first genocide of the 20th century — and that genocide continues to occur in modern times, all over the world. In the past few weeks, Armenians have watched history repeat itself as foreign Islamic extremists sacked the predominantly Christian Armenian town of Kessab, Syria, displacing thousands of peaceful Armenians. Today, the Armenian Genocide remains the second-most studied genocide event, after the better-known Jewish Holocaust of World War II. In fact, when Adolf Hitler was asked how the world would respond to his “Final Solution” plan — the extermination of the Jewish people in Europe — he replied, without compunction: “Who, after all, speaks today of the annihilation of the Armenians?” Turkey, the successor state of the Ottoman Empire, has yet to acknowledge the Armenian Genocide, despite repeated calls from historians and world leaders. Over 20 countries and 40 U.S. States officially recognize the Armenian Genocide committed by Turkey, including the State of Florida. A traditional Armenian performance by renowned musicians Joe Zeytoonian and Myriam Eli will take place following the walk, and food and refreshments will be provided. Registration begins at 7:30 a.m., while the walk starts at 8:30 a.m. at the Mizner Park Amphitheater, located at 590 Plaza Real in Boca Raton. Registration for the Walk Against Genocide is $19.15, including a T-shirt and a bottle of water. Children under eight years old may participate for free. To learn more, sponsor a walker, make a donation or sign up for the event, please visit http://www.walkagainstgenocide.com.